Twitch stream build "Semi Mini" completed. I’ve been streaming twice a week on Twitch from my workbench, this is been a great way to get various projects that have been hanging around done since I’m at the desk for at least 2 hours a week generally closer to 4. This is one of the vehicles that I’ve done from start to finish on the Stream, over the course of a few weeks. 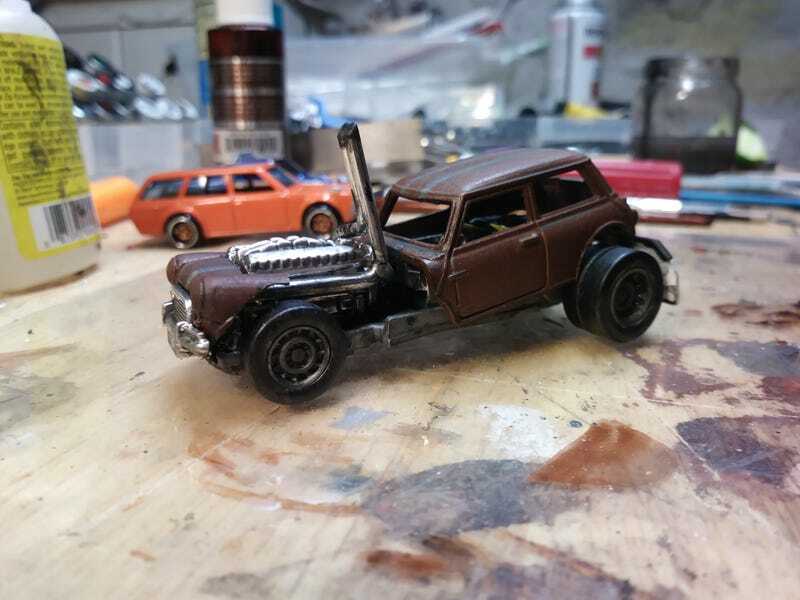 I started with a matchbox Mini Cooper and a diesel engine out of a race semi, use the chassis from a Hot Wheels Door Slammer and a few other bits and pieces including the tires from the same race semi. I’m really happy with how it came out. I’ve been working on a couple other stream Vehicles as well. Including a custom drift Subaru being referred to as the Rat Brat that is done except final details, weathering and rust.